This excellent exercise emphasizes on the quality of the jump and the horse’s understanding by encouraging him to analyse the situation and therefore to organise his movements. 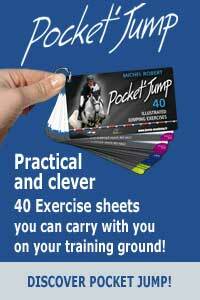 This thorough exercise encourages the horse to stay calm on combinations and to break down his movements on each jump. The grid is also excellent at improving the horse’s style and his front legs ‘speed of reaction. Horses who have a tendency in rushing to the rails will find themselves in difficulty over the grid. They will have to analyse the situation and understand that staying calm and reorganising their trajectory will be the correct answer. Riders will have to be in the same state of mind and wait for the jump, up to the take-off stride yet maintaining a straight line going thru the grid. 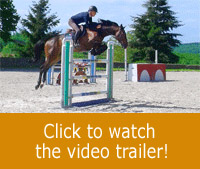 This exercise is thorough as it includes a bounce, a vertical, and an oxer. It can be practised in both directions. It’s unnecessary to jump high. In this way, we need to be looking for the quality of the jump and the horse’s understanding.